A graphic novel written by Greg Pak based on the songs of Jonathan Coulton. Art by Takeshi Miyazawa, colors by Jessica Kholinne, letters by Simon Bowland. Buy it digitally at Comixology! Buy the signed graphic novel at the Greg Pak Shop! LIMITED TIME ONLY: Buy the T-shirt, long sleeved tee, or hoodie at Teespring until Dec. 7! 2014.12.09 – Greg Pak at Comic Book Club Live in NYC Tuesday night! I’ll be a guest at the Comic Book Club live show in New York City at 7 pm on Tuesday, December 9. It’s at Fontana’s Bar, 105 Eldridge Street between Grand and Broome, and it’s FREE! It’s a fun show that I’ve done many, many times over the years. It’s a talk show format, with lots of hijinks and laughs and audience participation and even a bit of serious comics talk! I’ll also have copies of “Code Monkey Save World” and maybe “Make Comics Like the Pros” for sale! Comments Off on 2014.12.09 – Greg Pak at Comic Book Club Live in NYC Tuesday night! Code Monkey Save World T-shirts available until Dec. 7! Get your Code Monkey Save World T-shirts at Teespring.com/codemonkeysaveworld today! If you missed out on snagging a T-shirt during the “Code Monkey Save World” Kickstarter, this is your lucky week! We’ve launched a Teespring campaign where you can order T-shirts, long sleeved tees, and even hoodies. So if you have a Code Monkey in your life who needs a shirt or hoodie, check out the campaign today! Teespring also says T-shirts will be delivered to US addresses 7-10 days after the campaign ends on December 17, so while we can’t guarantee it, there’s a decent chance the shirts will arrive before the holidays. Comments Off on Code Monkey Save World T-shirts available until Dec. 7! Special RED variant CODE MONKEY SAVE WORLD trades for sale at Special Edition NYC! Yes, I’m going to the Special Edition NYC comic book convention this weekend — and I’ll be selling both the regular trade paperbacks and the SPECIAL RED VARIANT trade paperback of CODE MONKEY SAVE WORLD in Artists’ Alley at table T9! Buy your tickets to the con here! Here’s my whole schedule for the con. Comments Off on Special RED variant CODE MONKEY SAVE WORLD trades for sale at Special Edition NYC! 2014.06.14 – 06.15 – Greg Pak’s Special Edition NYC schedule! I’ll be at the Special Edition NYC comic convention on June 14 and 15 in Artists’ Alley, Table T9, signing books and selling rare physical copies of CODE MONKEY SAVE WORLD, the graphic novel I wrote based on the songs of Jonathan Coulton! Come see, come see! Comments Off on 2014.06.14 – 06.15 – Greg Pak’s Special Edition NYC schedule! 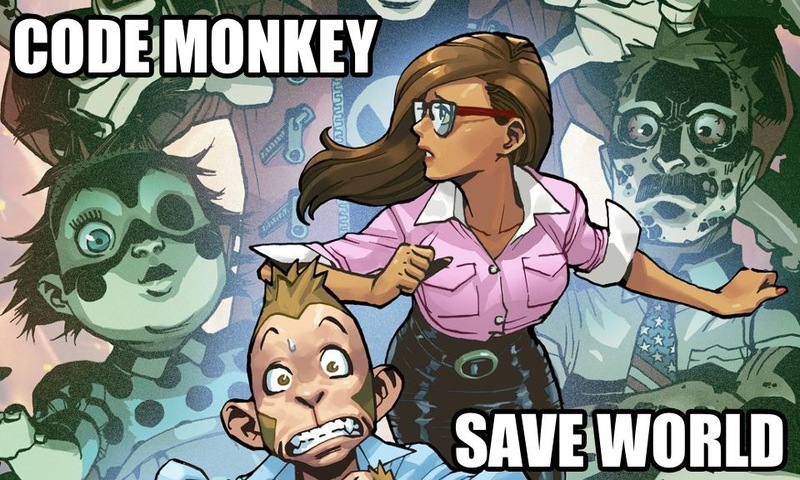 Comments Off on Where can you buy the CODE MONKEY SAVE WORLD graphic novel? Comments Off on 2014.06.01 – Greg Pak signing this Sunday at Comicopia in Boston! TUROK #1, ACTION COMICS #28 and CODE MONKEY SAVE WORLD #3 on sale today! Hey, friends. It’s a big Wednesday for me — three of my books hit stores! Hope you’ll consider checking them out. And if you’re in NYC, please come see me tonight from 6 to 8 pm at JHU Comics! TUROK DINOSAUR HUNTER #1 is the story of an exiled Native American persecuted by his own tribe whose world turns upside down with the arrival of dinosaurs. The book is illustrated by Mirko Colak with colors by Lauren Affe and letters by Marshall Dillon. Nate Cosby is our fearless leader and editor. Grab it from your local store, nab it on Comixology, or get it via mail order from Dynamite! ACTION COMICS #28 continues the exploration of the world of Subterranea, where Superman and Lana Lang learn of an entirely new threat — and spend a little more time with each other. Art by Aaron Kuder and colors by Wil Quintana. The Comic Current calls the book “flawless” and All-Comic.com gives it five stars. Grab it at your local store or nab it on Comixology. Art by Takeshi Miyazawa, colors by Jessica Kholinne, letters by Simon Bowland, and based on the songs of Jonathan Coulton. Comments Off on TUROK #1, ACTION COMICS #28 and CODE MONKEY SAVE WORLD #3 on sale today!